Need die cuts in the shape of a company logo? Or a sheet with die cut vinyl stickers for kids with various shapes laid out on each sheet? Die cut labels for easy application? Need custom die cut stickers in your hands TODAY? Custom die cut labels brand a product or company simply, quickly and affordably, so that the company stands out from the competition. The labels can be adhered to bottles, boxes, jars, luggage, laptops, custom packaging, or directly on products themselves. These labels are either created from durable laminated vinyl that resists scratching, moisture, heat and sunlight, or created on simple matte paper or gloss paper material, with lamination or varnish or without either. Die cut vinyl stickers are one of our most popular items, because they last for a long time indoors or outdoors. Therefore, these stickers are the best “bang for the buck”, whether they are for business or personal use. With the fastest production time in the industry, we can produce custom die cut labels that are completed TODAY. Any shape, any size, any format. Previously, our clients had to wait 72 hours for production, but now we are able to print custom die cut stickers and labels same day. Please contact us below for more information. What does all the above mean in English? 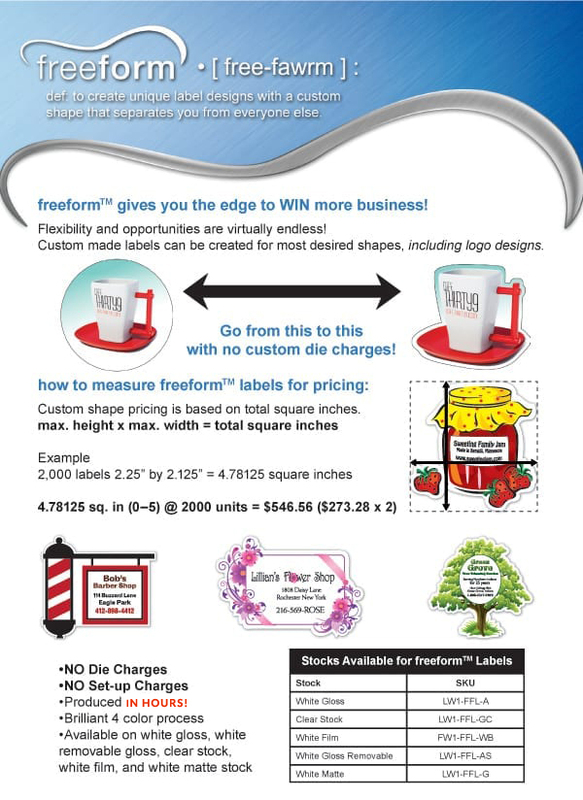 The term, “freeform” is just what we call a custom die cut. We’ve shown you above how to measure the height and width of the die, so just let us know the size and we can give you a quote. As stated above, there is generally no limitation to the shape that we can create, and using this process, there is no need to create custom dies. We can also print full-color or one or two color just as easily. If you prefer die cut vinyl stickers, printed on custom-made vinyl stock which is moisture and oil resistant, that is also possible. We also offer glossy or matte options for finishing. We print digitally, which explains how we are able to churn jobs out within hours. We can also print flexographically, using plates, which take longer, but the advantage to that process is that we can match colors closely if needed. Either way, the quality is excellent, and the materials we use are always top-notch. Stickers can be provided on sheets that are pre-cut with each individual sticker laid out on the sheets, or can be printed individually for handouts. When ordering, please specify how you would like them supplied. The default option is to provide the stickers on sheets. Regardless, this is an opportunity to create a company logo sticker that can be used to promote the company in many different ways. Just imagine the possibilities…stickers can be placed indoors, outdoors, on equipment, on products, as promotional handouts, etc. And if you have ever wondered why there are different terms for “labels” and “stickers”, essentially both terms mean the same thing… adhesive backed paper, vinyl or polyester material. If you look up the definitions in the dictionary of both terms, you will find that they are very similar, so there really is no difference. Call them whatever you like, but we call them our business! Q: is it possible to have a die cut within a die cut? A: Yes, our custom die cut sticker printing cutting process allows us to die cut and print in almost any fashion. When supplying artwork, make sure a die line is included to show us exactly where all the cuts will be. This is crucial to avoid errors. Q: Is it possible to apply labels to surfaces that are not flat? A: Please let us know before ordering and we can use special material that is made for rounded surfaces. That’s important to know, because the material is either made for rounded surfaces or not. Above all, we want you to be happy with the result, so make sure this is communicated to us before ordering. Q: Are these stickers hard to apply or remove? A: Not hard at all to apply, but if you order permanent adhesive, they are permanent, so you’ll have to work a bit harder to remove. This is why we suggest removable adhesive when labels need to be removed without great effort. To apply, just make sure to start from the center of the label when applying. Then you can push out air bubbles with your fingers or use a plastic or hard cardboard item to smooth it from there. When removing permanent adhesive, carefully peel from the edge of the sticker slowly. This will ensure smoother removal, so that they can be removed from particular surfaces. No need to worry if you have removable adhesive. They are made for removing from almost all surfaces. A: We suggest at least 1/8 of an inch bleed all around the design. We have provided file guidelines at the bottom of this page to help. Keep in mind though, that if you don’t add bleed, there will be a white border all around the label. This may or may not be what you want, which is why we suggest adding bleed if a border is not wanted. Again please check the bottom of this page for specifications. Q: Is there any limitation to what these stickers can stick on? A: Unless you are ordering our strongest tire adhesive, we would say yes, there are limitations. Limitations exist on rough surfaces and/or hard to stick surfaces. Our tire adhesive is made for these types of surfaces. Please keep in mind that if you order vinyl, that will be more durable than paper. Also please note, that we print removable stickers and labels as well. Removable means that no residue is left behind when removing. In general though, always make sure that the area is clean and dry when applying for best results. If the surface is dirty, the glue will pick up the dirt and make it less sticky! Q: What is the turnaround time on die cut sticker printing orders from when the order is placed? A: Depending on whether we are working on a rush order or a standard order, times can vary. We are able to print within hours. Labels are available for pickup on the same day, but generally, if we are working on a standard order, it takes about a week to complete. We always send a proof by email as the first step. This is to make sure that you are happy with the way everything looks before we begin printing. Once that is approved, we begin printing. Q: What is the difference between standard adhesive and removable adhesive? A: Our standard adhesive is made for general surfaces, and considered permanent adhesive. Generally, that means that it should stick forever. The longer it stays on a surface, the more permanent it becomes, therefore, it is possible to remove from certain surfaces if immediately taken care of. Removable adhesive on the other hand, is made for removing at any time. They are easy to remove from almost any surface. Always discuss this with your sales rep when ordering. We can then discuss options for your particular application. Please create file as vector and save as EPS or PDF. Always include the cut line (otherwise known as die line). Make sure the die line is either .5pt or 1pt thick. Please be aware that very thin lines become difficult to cut, and extremely small shapes may likewise be difficult to die cut. Bleed for labels should be a minimum of 0.125″ from the cut line all around.